With offers for other works flying fast and furious at him, Verdi proceeded on Il trovatore with libretist Salvadore Cammarano, without a specific commission in hand, urging him to be "bold ... the more unusual the better." The libretto was honed via much back and forth letter writing between the two, with give and take on both sides, until Cammarano's death in 1852. This was a great personal and professional blow to Verdi, but he forged ahead with a young and promising librettist, Leone Emanuele Bardare, who modified the previous draft (which had been completed into the third of four acts), according to Verdi's instructions on expanding the role of Leonora, to make it "a two-woman opera," as well as modifications in one of Azucena's arias and some of the Count's lines. The result is an epic that is filled with scenes that quickly alternate between "safe" and "unsafe" emotions, eventually delivering a series of catharses that amplify the climactic effect, much like The Da Vinci Code within the popular fiction genre. During its initial successful run, the much-larger-than-life opera was translated into French, and Verdi inserted a ballet, qualifying Il trovatore as "grand opera," which the quintessential score and story gloriously support! The four main characters—Leonora, Count Di Luna, Manrico, and Azucena—intertwine in multiple plots: the Count and Manrico are on opposite sides of a civil war; the Count and Manrico are in love with the same woman, Leonora; the Count's father burned Azucena's mother at the stake for witchery; Azucena kidnapped the Count's brother; Leonora loves Manrico and despises the Count; Manrico's loyalty and love is split between Azucena and Leonora. 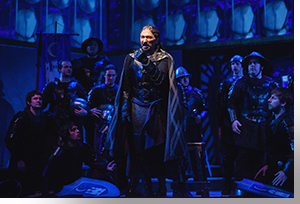 Thus, Verdi's desire for a bold and daring plot came to complete fruition: the scope of Il trovatore encompasses war, love, compassion, and revenge. 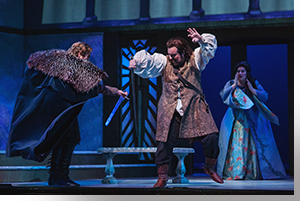 In the opening act, a captain of the guard, Ferrando (Ashraf Sewailam) provides an expressive bass narrative of the backstory of Azucena and the Count, after which the love triangle begins to unfold before us, beginning with Leonora (Alexandra Loutsion), who, after hearing the troubadour's serenade, sings of how she has fallen in love with him, in her lovely, full-range soprano. While she does so, we are introduced to the wonders of fully integrated set design and digital projection, by the director Joachim Schamberger, who reveals Manrico (Jonathan Burton), behind a scrim, playing his lute and singing to Leonora in his warm, well-rounded tenor. She responds with a splash of coloratura and sings of a love beyond words. 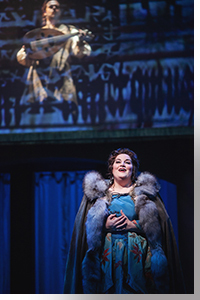 The Count (Michael Mayes) also sings of his infatuation with Leonora, in his rich, penetrating baritone. All this immediately leads to a duel in which Manrico is victorious, but spares the Count's life. Act II opens with the Count and his many troops pursuing and attacking Manrico, and believing that they have slayed him, but Azucena finds her son on the battlefield and takes him to the gypsy camp (where she raised him) to nurse him back to health. During his recovery, Manrico watches the gypsies work, which leads to Verdi's famous anvil chorus, performed to perfection by the chorus. 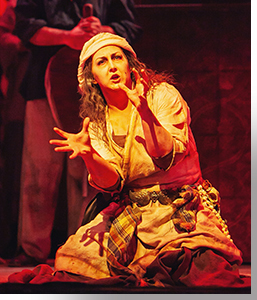 Following this, Azucena (Lindsay Ammann) sings a chant of revenge that recalls the horror of her mother's death by fire at the hands of the Count's father. Ammann delivers a powerful lamentation with her expressive mezzo. Here, director Schamberger's projections fill the stage with fire, and his use of imaging only gets better from here. This searing moment is followed by an amazing conversation between Azucena and Manrico, regarding their relationship—Is he her son, or not?—which is never fully resolved, as Manrico receives a letter that compels him to assume command of the rebels and to prevent Leonora from taking the veil, because she believes he has died. Azucena has a bad premonition about all this, but Manrico will not hear it. At the cloister, Leonora sings a mournful tune concerning her fate, when the Count and his soldiers reveal themselves and attempt to kidnap her. Once again, Mayes baritone fills the hall with the Count's obsessive possessiveness, until Manrico arrives with his troops, scoops up Leonora, who prevents him from killing the Count, and steals away. The stain glass projections are divine. The third act begins with the Count preparing to lay siege to the castle where Leonora and Manrico are holed up—as the projections reveal a vast army—where he once again reverberates his desire. His soldiers bring a captured Azucena to him, and he orders her to be burned at the stake. She incants for Manrico, her son, to save her. The Count gloats that he will now have revenge for her killing the baby he assumes was his brother. Just before Manrico and Leonora are to be wed, after a couple of sweet duets, Manrico learns of his mother's capture and runs off, as Burton's tenor captures Manrico's passionate vow to save her. In the final act, we find both Manrico and Azucena captured and at the mercy of the Count, as Ammann stuns us with an incredibly heart-wrenching despondent aria. Leonora lurks nearby in the courtyard, with Loutsion embodying her unbounded despair. 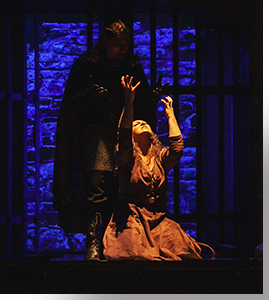 The Count finds her and she offers herself to him, on the condition that he releases Manrico. She then poisons herself and hopes to die after Manrico is free and before the Count possesses her. Meanwhile, Manrico consoles the unhinged Azucena with visions of going back home to the mountains of Biscay, in a tender aria by Burton. When Leonora appears and tells Manrico that she has arranged his freedom, he rejects her—in a bittersweet song—as having sold herself to the Count, until she collapses and he realizes the truth of what she has done. The Count then orders Manrico's execution and makes Azucena watch it. The Count exults as he exclaims that her son is dead, but his mood quickly collapses into despair, upon hearing Azucena exclaim, "O Mother! Mother, you are avenged! ", and realizing he has just killed his brother! Conductor John Baril and the festival orchestra are magnificent. 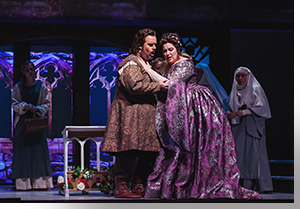 All the elements that make this Verdi masterwork so popular are on full display in this robust production. 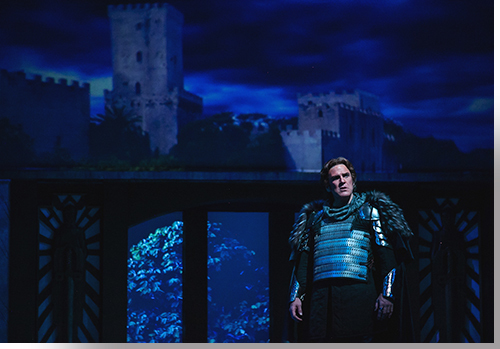 Central City Opera's presentation of Il trovatore, runs through August 5th, in repertory with The Magic Flute and Acis and Galatea. For tickets: https://centralcityopera.org/2018-events. 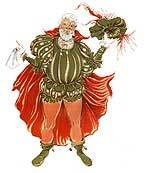 1Julian Budden, The Operas of Verdi: 2. From Il Trovatore to La Forza del destino, Cassell, London, 1984, p.59.